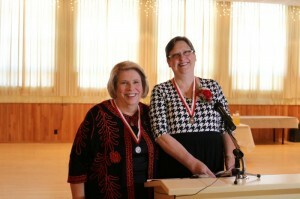 This year the Annual Pulaski day Banquet was connecting with the celebration of 100 Anniversary of the central Citizens Committee. The Polish American Central Citizens Committee is a service organization that was initially established to help recruit soldiers to serve under General Haller during World War I. Today the organization supports Polish and Polish-American organizations. What is the mission of the Central Citizens Committee today? The answer is giving by Barbara Gronet, vice president of PACCC. The “Pulaski Medal” award recipients in 2014 are listed on page 14. Congratulations! As with any organization, the primary objective changes needs to change with the times. Gone are the days when there is a need to recruit soldiers to fight for Poland’s independence. Now is the time to support and acknowledge the good works of Polonia’s members in Detroit. “We, Americans of Polish descent, desire to have a common center, in order to work united and more effectively for the benefit of the United States and Poland. We desire to arouse our youth to be aware of, and to respect, the ideals of their nations and to defend its image and name. We also wish to intensify our love to work for our community and nations, leading to a better existence and the attainment of more honored positions in the American community. Membership is attained by completing a mandate form and submitting it with the dues for the year (Currently $10). The application is then brought before the membership for approval to join. Membership is not automatic. For more information, contact Barbara Gronet (313) 365 – 8949 or David Ledwon (586) 773 – 2240 for an application.